Rank and organization: Major, U.S. Marine Corps Reserve, Marine Squadron 214. Place and date: Central Solomons area, from 12 September 1943 to 3 January 1944. Entered service at: Washington. Born: 4 December 1912, Coeur D'Alene, Idaho. Other Navy award: Navy Cross. Citation: For extraordinary heroism and valiant devotion to duty as commanding officer of Marine Fighting Squadron 214 in action against enemy Japanese forces in the Central Solomons area from 12 September 1943 to 3 January 1944. Consistently outnumbered throughout successive hazardous flights over heavily defended hostile territory, Maj. Boyington struck at the enemy with daring and courageous persistence, leading his squadron into combat with devastating results to Japanese shipping, shore installations, and aerial forces. Resolute in his efforts to inflict crippling damage on the enemy, Maj. Boyington led a formation of 24 fighters over Kahili on 17 October and, persistently circling the airdrome where 60 hostile aircraft were grounded, boldly challenged the Japanese to send up planes. Under his brilliant command, our fighters shot down 20 enemy craft in the ensuing action without the loss of a single ship. A superb airman and determined fighter against overwhelming odds, Maj. Boyington personally destroyed 26 of the many Japanese planes shot down by his squadron and, by his forceful leadership, developed the combat readiness in his command which was a distinctive factor in the Allied aerial achievements in this vitally strategic area. In 1941, just prior to the entry of the US into World War II, Boyington's career in the Marines was faltering due to a number of drunken brawls. Eager for a change, he responded to Claire L. Chennault's recruitment of American fighter pilots to join the Flying Tigers, his group of mercenary pilots flying for the Chinese Air Force. Quickly rising to squadron leader, he had accumulated 6 kills against Japanese aircraft by the time the Flying Tigers were disbanded in July 1942. Overcoming some red tape to get his Marine Corps commission reinstated, he was assigned to the Solomon Islands. At the time, there was a sufficient pool of replacement pilots and aircraft available in theater awaiting assignment that were not needed in already established fighter squadrons, so Boyington persuaded his superiors to let him form them into another squadron. Not having gone through the routine of forming and training as a unit within the US, they unofficially called themselves Boyington's Bastards and then adopted the official squadron nickname of the Black Sheep. Boyington, at 31 a decade older than most of his men, became forever known as "Pappy". Quickly becoming operational, under Boyington's leadership the Black Sheep scored 97 confirmed kills, 35 probable kills, damaged 50 enemy aircraft and destroyed 21 on the ground during their 84-day first combat tour. 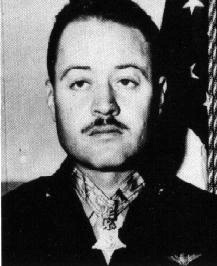 Boyington scored 22 kills during this period (the number 26 in the citation being a slight error) to add to the 6 he scored as a Flying Tiger for a total of 28. (Captain Joseph J. Foss, another Marine fighter squadron commander and Medal of Honor recipient, had previously scored 26, all with the Marines, so either man could arguably claim the title of top Marine Corps ace.) Near the end of the tour, Boyington himself was shot down over the Pacific, then strafed and wounded by Japanese fighters as he floated in his liferaft before being captured by a Japanese submarine. Never reported by the Japanese to be a Prisoner of War, he was presumed dead and his Medal of Honor awarded "posthumously". He reported in his autobiography Baa Baa Black Sheep that he never recovered emotionally from the 20 months of torture he received from the Japanese, or his learning of his own "death" upon his repatriation after the war. He was medically retired as a Colonel and had several marriages and divorces, alcohol problems and a nearly fatal case of emphysema over the next decades, the successful sale of Baa Baa Black Sheep in the 1950s being one of the few high points. In the mid-1970s, NBC decided to adapt Baa Baa Black Sheep into a TV movie and then a series, and Boyington, continually in debt, gladly sold the rights and agreed to serve as technical advisor and appear in an occasional cameo role as a General. Thus began the myth that the Black Sheep squadron were so-called because they were a bunch of undisciplined misfits and screwballs (as the opening credits to the movie and series attested). The movie begins with Boyington quitting the Flying Tigers after a dispute with Chennault and stealing a P-40 fighter to return home. After arriving in the Solomons, he springs several pilots from the brig who were under arrest for drunken brawls, and then steals the F4U Corsairs from another fighter squadron to form the Black Sheep. 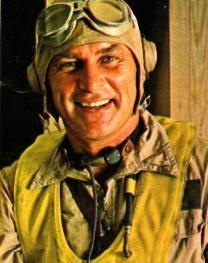 Throughout the run of the series, Boyington is depicted to be as much at war with his commanding officer (played by Dana Elcar, better remembered today as the title character's mentor in MacGyver) as with the Japanese, and the Black Sheep as being constantly drunk and in trouble, flying while hung over and still beating their Japanese opponents. (Any veteran of the Solomons campaign will attest that the opportunities to be that drunk were few and far between in that theater of operations.) The nadir of the series came in the second season when a crew of Navy nurses was added to the regular cast as romantic interests for the squadron, and dubbed "Pappy's Lambs" in response to the competing series Charlie's Angels. An article in TV Guide written during the run of the series by the Black Sheep's intelligence officer, which explained the true origins of the squadron and its nickname and tried to dispel the myths of the series, concluded, "Screwballs? Misfits? Don't you believe it!" While that article went largely unheeded, Boyington drew the wrath of his former subordinates at the next squadron reunion following the release of the series and, a rarity for him, apologized to them. Another Black Sheep veteran later commented in another magazine article that he was glad that no real names other than Boyington's were used in the series. "I did not want to be associated with it, anyway," he said. "The only thing accurate about the show was that we flew Corsairs. That was it." One can only speculate as to why Boyington allowed such a travesty to take place in his name, although the closing line to the book version of Baa Baa Black Sheep, "Name me a hero, and I'll prove he's a bum!" can speak volumes to a psychologist well versed in the concept of self-esteem and in Sigmund Freud's defense mechanism of projection. Hollywood should have known better, and the way that it exploited this particular hero in his moment of weakness in itself also speaks volumes.